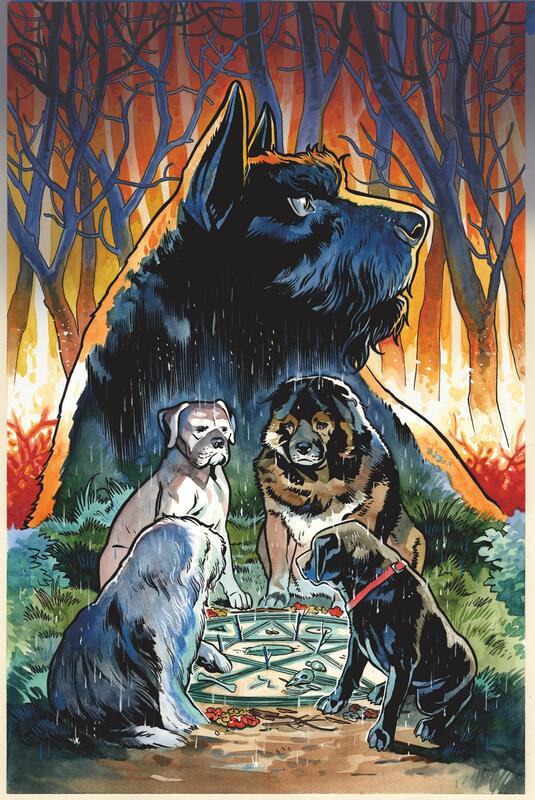 Beasts of Burden: Wise Dogs and Eldritch Men follows the heroic pack of canines known as the Wise Dogs as they take on a series of new horrors and find a link among seemingly unrelated occult disturbances plaguing Burden Hill and the surrounding areas. Their discovery leads them to a mountain village inhabited by a survivalist witch-cult who have uncovered the existence of a “Blood Lure” attracting occult forces, creatures, and many more terrors to Burden Hill! Beasts of Burden began as a recurring feature in the Dark Horse Book of … anthologies before graduating into its own miniseries. The animal protectors have also teamed up with Hellboy and appeared in Dark Horse Presents. You can check out some additional art from the new series over at the AV Club.